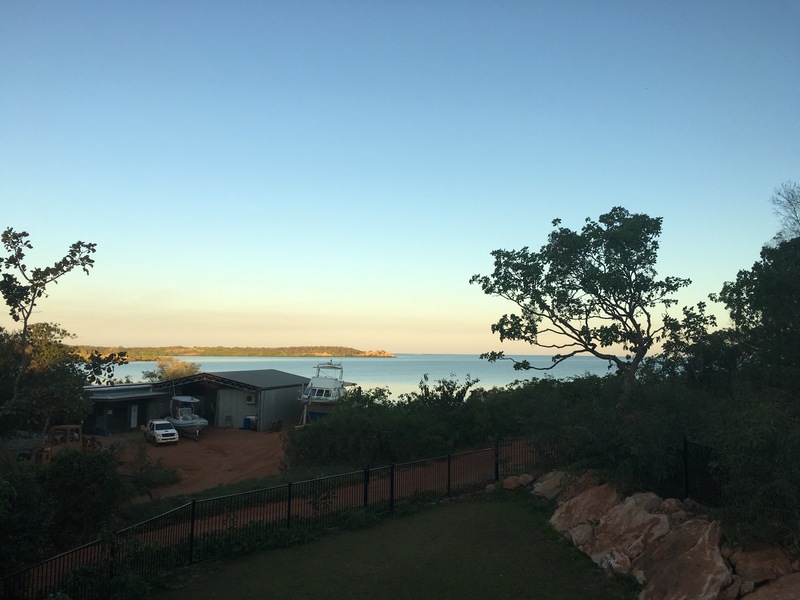 Driving back down that angled sandy road that is Cape Leveque Road and I began to feel myself scratching… At dinner on the balcony at Cygnet Bay last night I had remembered to put on our repellent but I hadn’t put anything on while we walked around the farm on tour. The itching was relentless and I soon realised that I had in fact been attacked by midgies! 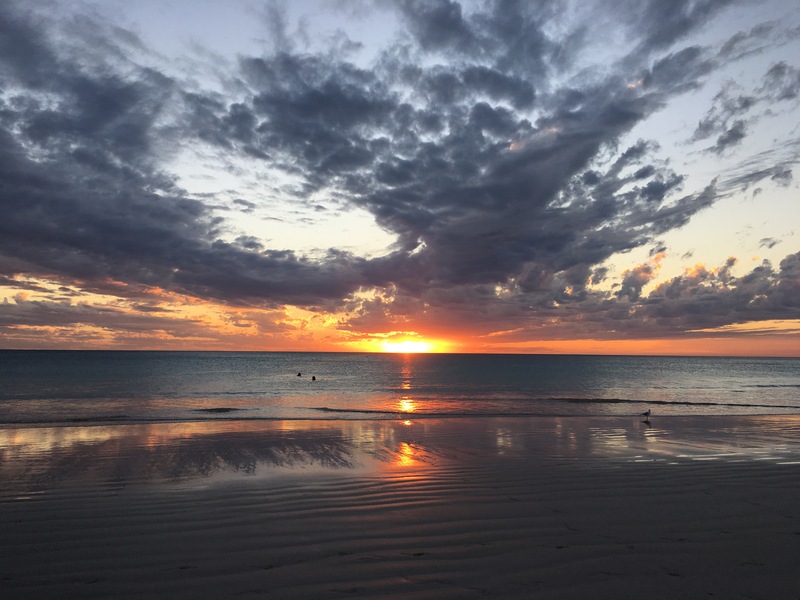 My only solace was that I was on my way to Broome for two more nights (though I had started to seriously contemplate extending that to four nights before I even got there). We stayed at Cable Beach Caravan Park again only this time, we weren’t by the pool but up the back against the shed (I’m sure it was their last and only ‘spare’ site) this was peak time and school holidays for WA so the place was jam packed. 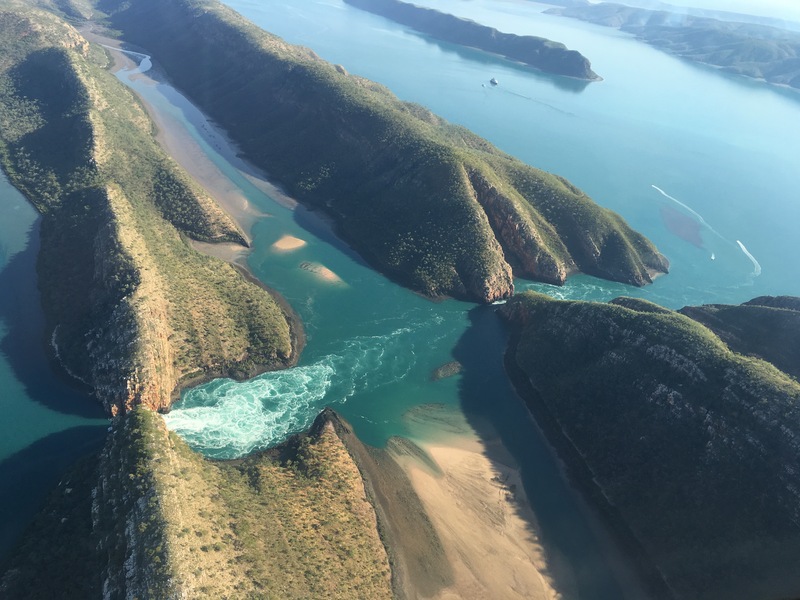 We got in to Broome again on a Thursday afternoon but didn’t bother with the market this time around and opted instead for an early night as we had booked a scenic flight over the Horizontal Falls the next day. 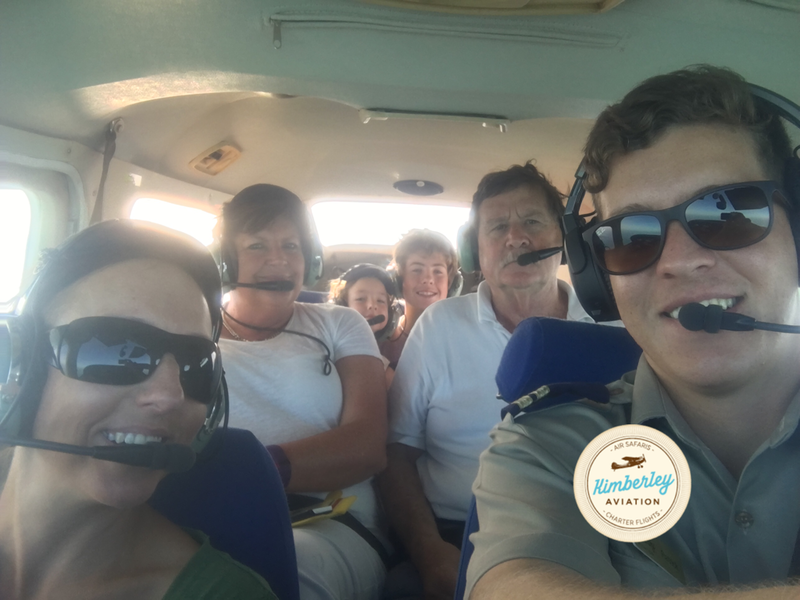 We were picked up by the airline mini bus early in the morning and shuttled to the airport to board our little plane with just two other passengers Pip and Mike (their son played for Carlton but I don’t remember his name – wrong team for me to care about). I got to sit next to the pilot for the flight up which was a little exciting until I realised that planes are designed for tall people (there are no short pilots) and I couldn’t see out the front window and there were no phone books on hand to give me a lift. I could still see out the side windows though and the kids were right up the back where they could see out the side windows and out the back one. As we flew over the falls we could see some of the jet boats driving through the falls and I felt a little disappointed that we hadn’t been able to do this (they were booked out weeks in advance) until I was told that it’s a pretty rough and fast ride and that despite being securely strapped in, I’m sure would’ve frightened the crap out of Miss6 enough to make it less enjoyable. The view from the sky however, was calm and equally spectacular as we got to take in the surrounding area and see just how unusual and rare this water mass is – it would’ve been even better if we got to fly over them just one more time around before leaving though. 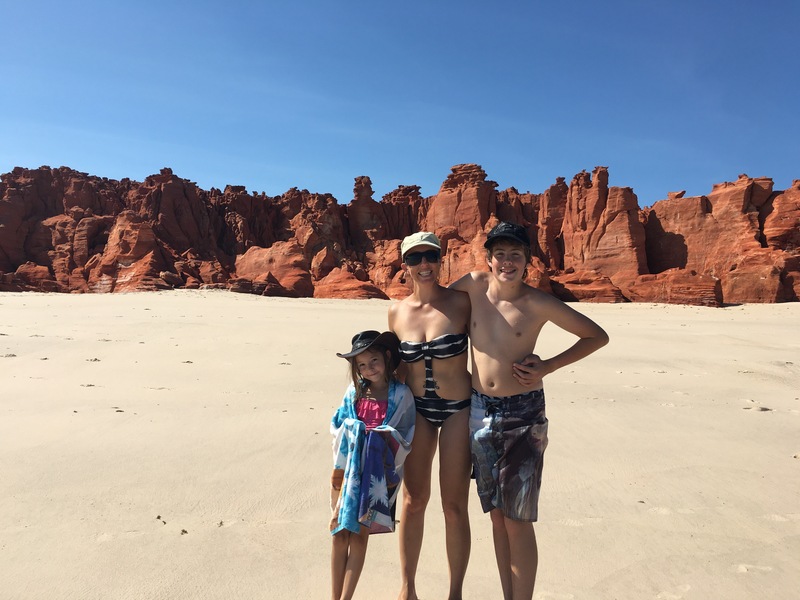 After circling the falls a couple of times we flew to Cape Leveque and landed here for a huge hot breakfast and coffees followed by a couple of hours of free time to go and swim or explore. There wasn’t much to explore there so we opted to go to the beach for a swim. The views were gorgeous but the water wasn’t very kid-friendly. The waves were coming into shore with great strength and speed and you only had to walk a metre from the shore and you were in shoulder high water. This meant that I had to hold Miss6 on my hip while trying to plant my feet firmly in the sand as the super strong currents pushed me in to shore and then tried just as hard to pull me out to sea. It was more hard work than it was worth so I took Miss6 back to shore and had a little paddle on my own before we opted to stay on the sand and look for shells and go for a walk. Master14 stayed in the water a bit longer – he seems to really be enjoying the beach life and swimming in the ocean. 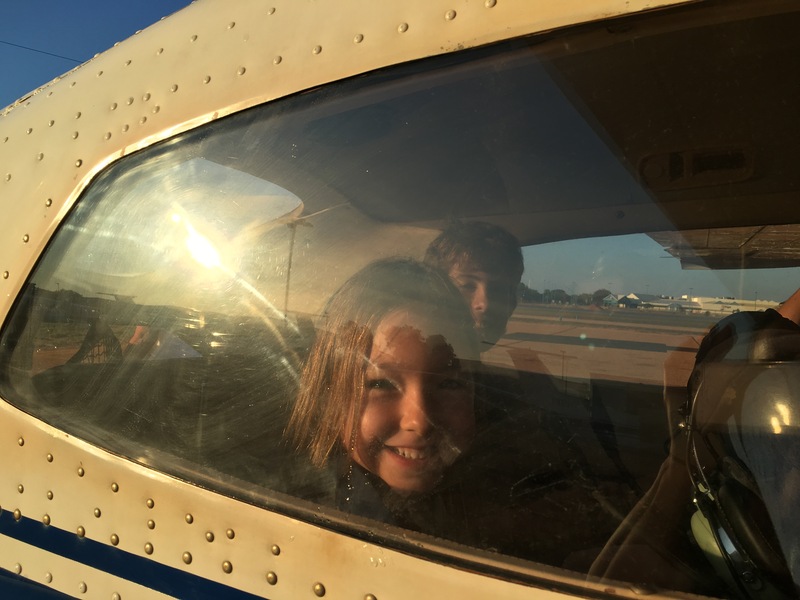 Back to the plane and this time Master14 got to ride shotgun with the pilot and Miss6 and I sat up the back. It was a lovely day and I’m glad now that we’d stayed at Cygnet Bay and not Cape Leveque earlier in the week (all except for the midgee bites that were now making me start to look like a junkee with red blotches all up my legs, arms, back and neck). With our plans to leave Broome the next day and head south I knew that we would officially be ‘on the way home’. I wasn’t ready for that just yet and still felt pretty exhausted from the first half of our adventure so I extended our stay to cover the weekend. We opted for a sleep in on Saturday morning and Miss6 woke deciding that since we weren’t going to the Saturday morning markets, that she’d make her own market stall and make her fortune. 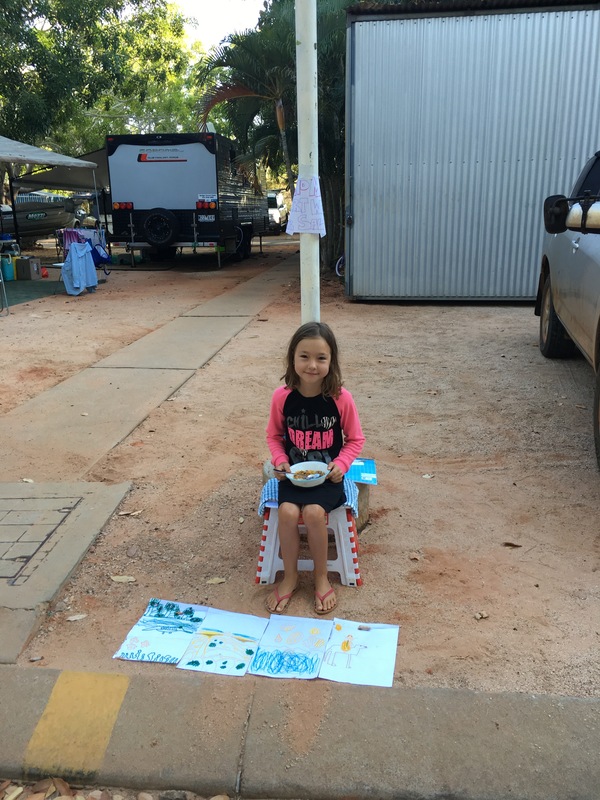 She started drawing some Broome inspired pictures of sunsets, camels and the beach and set herself up with a sign and stool out the front of our van. I managed to persuade her to only charge 10cents per picture rather than the original $10 she was thinking. The family camped next door to us, with three kids of their own under 7, came over and bought her first four pictures to stick up on their caravan wall. I was amazed that someone with kids and hand-made drawings of their own to find space for, paid money to have someone else’s pictures on the wall. Miss6 was amazed she’d sold out so quickly and had to get cracking on a new batch of pictures. Another neighbour, who was retired and came to Broome for four months every year (I’m seriously looking forward to retiring at this rate), bought a couple of pictures off her and then gave her the lowdown on who to go to to ask if they wanted to buy pictures. By lunchtime she’d made over $5 including a couple of young guys who’d seen the sign she had me make and put on the toilet block noticeboard, and got her to walk to their site so they could give her $2 each for a picture – she was rapt! The market stall continued for the rest of our stay at the caravan park and in the end she managed to make over $12 and had roped in the little boy next door to spruik for her and walk around the park with her yelling ‘roll up, roll up, get your handmade drawings here for just 10 cents’ – it was very cute. Master14 took Miss6 to the pool for me while I caught up on some ‘real life’ duties. When we’d arrived back in Broome this time around we noticed that the interior light was on when we opened up the van – this isn’t supposed to be possible as there’s a safety switch to either turn lights off if you’ve left them on, or to ensure that the lights don’t get switched on as you drive. As we pulled out the beds, we also noticed that the canvas on the beds was black and melted and had even burnt holes straight through – it was lucky the whole van hadn’t caught fire while we were driving! I didn’t want to risk this happening again on our subsequent drives after Broome and had arranged a caravan repair man to come and check out the van – he was so busy that he didn’t turn up Friday afternoon as originally booked and only turned up on the Saturday really late in the afternoon. The safety switch had a bend in it so it was a quick and easy fix to straighten that out before I set him to work to unblock the lock on our rear box – it was so full of dirt that I hadn’t been able to open it to use our jerry can funnel or grey water hose in ages. He finally got all of the dirt from the lock and fix it up for us leaving us 10 minutes to get to the outdoor movie cinema to watch Finding Dory that I’d promised the kids. At the end of the movie Miss turned around to find one of her little friends that we’d met in Kings Canyon and hadn’t seen since Katherine! 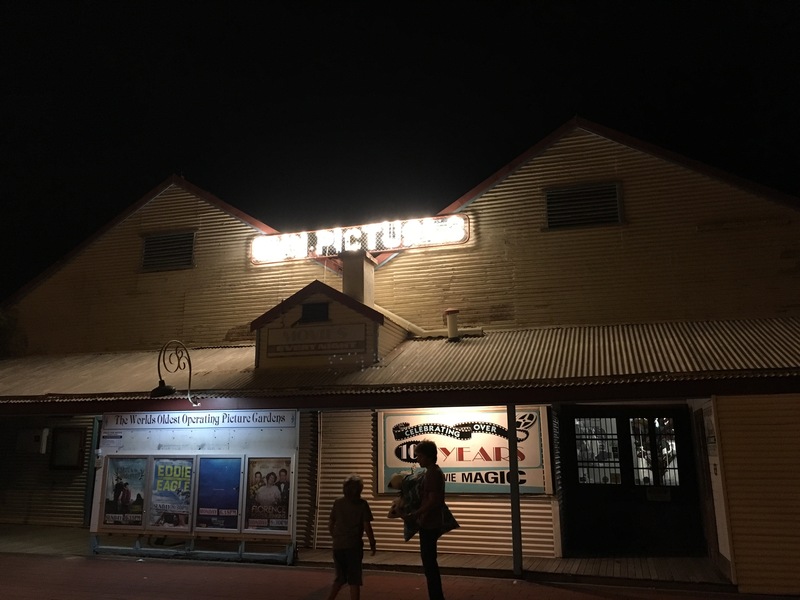 We ended up chatting for so long out the front of the cinema that we got home from our early movie really late. 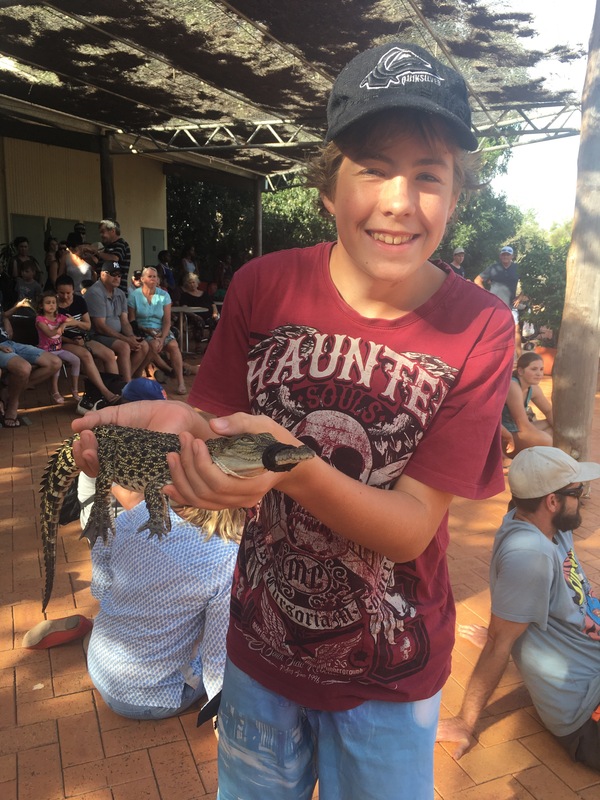 The next day the kids swam in the pool in the morning before we headed off in the afternoon to visit Malcolm Douglas’ Wilderness Park and see the infamous croc feeding session where we were hoping to see a death roll live. 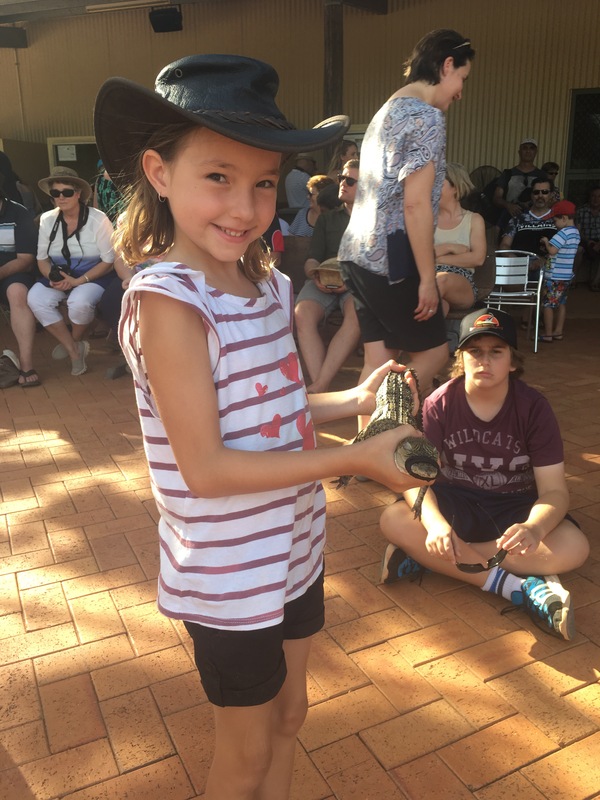 The park has a huge population of saltwater crocodiles all living in the one lagoon together plus a number of other smaller areas with just the one male and one or two females – some of which had their own claims to fame. The park provided a guided feeding tour where we got to walk around with staff and watch them feed the crocs while they talked about each one and the crocs put on a bit of a show as they fed. At the end of the tour the park was still open for another hour so the kids and I took a walk around the park and made the most of the time there – everyone else it seems, left as soon as the tour concluded – the park was empty as we walked around and the carpark deserted when we left. When we got back to the van I said to the kids ‘let’s not leave tomorrow’ and booked us an extra night – some serious denial about this ‘going home’ idea! 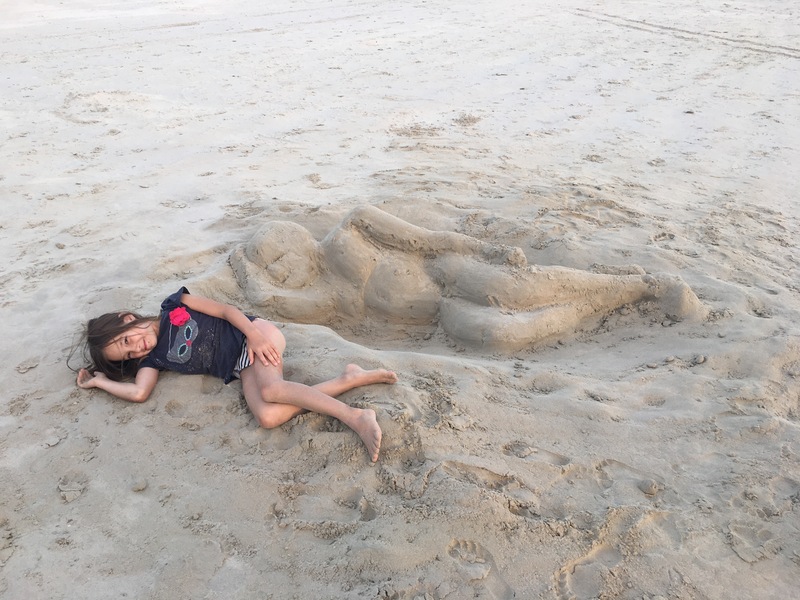 The following day after Miss6 and her new spruiker had a successful morning at their artwork stall, we thought we’d head to the beach to bum around and make sandcastles. On the way out we decided that we didn’t want to leave the next day either and added another night to our stay – bringing our original two night stay up to six nights! We were only going to stay at the beach for a couple of hours but the kids weren’t too hungry for lunch and seemed content with the snacks I’d brought so we stayed for several hours, moving our towels up the beach as the tide came in. 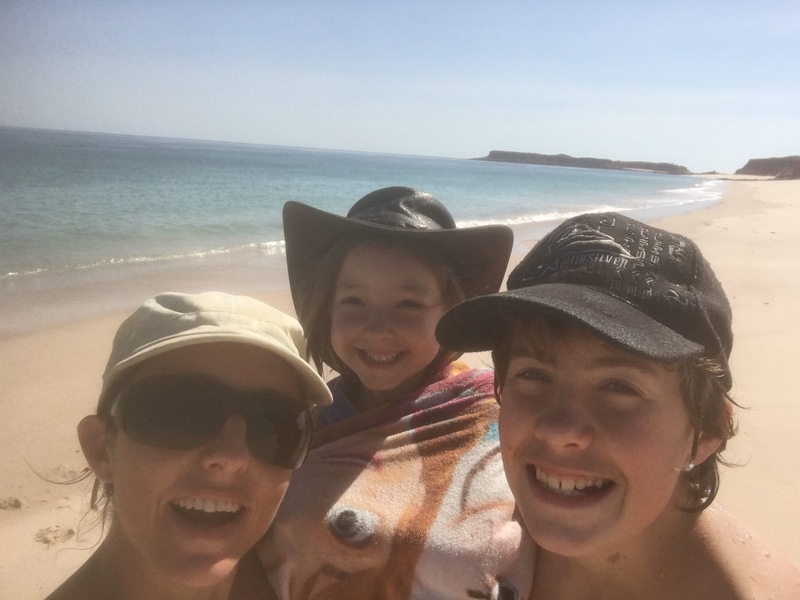 We were out far longer than planned and though I managed to get some reading done and the kids got lots of sandcastles built, we all managed to get sunburnt – sunburn would never happen in July in Melbourne (unless you were at the snow)! I knew my workmate was back from her tour so had messaged her to see if she wanted to hang out with us on our last day in Broome. We headed to the beach and hired a couple of beach lounges, buckets and spades and boogy boards for the kids ($25 for most of the day). I’d left my kindle back at the caravan park so I quickly drove back to grab it but couldn’t get in the front gate as there were people blocking the entrance checking in (why they didn’t park in the waiting bays on the street was beyond me and got me rather annoyed at the time) I left my car in the waiting bays and walked back to the van and grabbed the kindle. I realised that I hadn’t told the kids and my workmate where I was going (they thought I was going to the carpark to get something for Miss6 when I’d decided I may as well go back for the kindle) and that I should really hurry back so I grabbed Miss6’s Monster High scooter and raced to the front gate. This got a few laughs from those I scooted past (we were camped at the back of the park so there were a lot of potential witnesses to any spectacular stacks that I might make). One guy I saw visibly nearly spit his coffee out and another that yelled ‘hey did you steal some kids scooter? !’.I still managed to get back to the front gate only just as the driver blocking the driveway was managing to enter the caravan park. It was a cloudy and windy day this time so we didn’t stay as long but the kids still had a great time and we managed again to bump into our Kings Canyon family (who kindly reminded me that we needed to book online to stay at Cape Range National Park to see Ningaloo Reef and that they were booked out for the next week at least). Back to camp and our spruiking neighbours seemed to have the same dinner plans as us so we booked a table and all walked together to Divers Tavern for dinner and drinks before we knew we had to pack up in the morning. Miss6 was having a ball playing with the kids and I later found a bunch of selfies that she’d taken with their kids at the restaurant. The next day we said farwell to our spruiking family friends as they went out for the day and left us to pack up. We were about to leave at 10am (we’d unpacked a heap of stuff in the six days we’d stayed) but the car battery was flat again and needed a jump start. I was contemplating calling our spruiking family when Miss6′ number one customer and semi-permanent resident came to our rescue. Finally on the road and we’d actually managed to miss official check-out. We stopped at Bunnings to get a new gas bottle then stopped at the Auto Elec to get him to double check our safety switch and tell him about the battery. 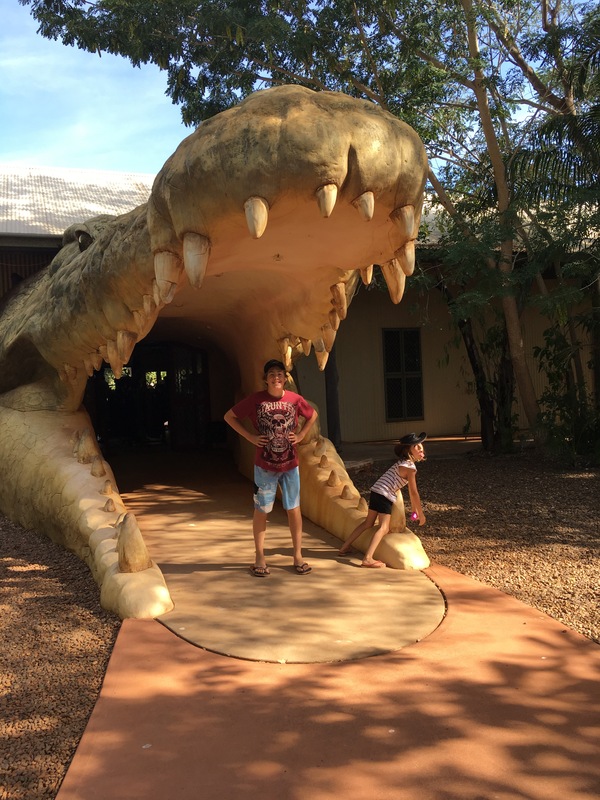 We didn’t actually leave Broome until 12.30pm – the latest departure of the entire trip so far! Staying in Broome was the first time I’ve felt like I was on holidays and could relax (perhaps with the exception of Alice Springs) as the rest of the trip has been more like an adventure with lots of moving and activity but I’ve actually been able to chill a bit more while here – a good rest before the last half of our trip home.